Robert Boston, the father of former NASCAR Camping World Truck Series driver Justin Boston, faces federal charges of fraud after his son’s messy departure from NASCAR’s top levels in 2015, according to ESPN. An indictment alleges that he was involved in a $25 million scheme that helped fund his son’s career. A press release from the U.S. Attorney’s Office of the Western District of North Carolina, where the case has been carried out, said both Robert Boston, 53, and Robert LaBarge, 50, face charges of wire fraud, securities fraud, bank fraud and money laundering in connection with the scheme involving a company called Zloop. 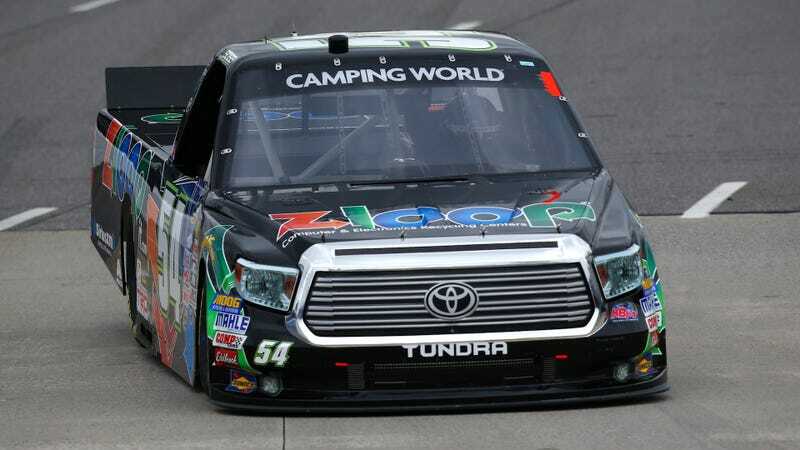 Founded by Robert Boston and LaBarge as an electronic-waste recycling firm in 2012, Zloop sponsored the Toyota Tundra raced by Justin Boston during his short time in the Camping World Truck Series. Federal law requires potential franchisors, like Zloop, to disclose certain litigation and bankruptcy matters in a franchise disclosure document. As alleged in the indictment, Zloop franchise disclosure documents omitted required information, including that Boston’s former company had filed bankruptcy, that Boston had filed personal bankruptcy, and that Boston had been held liable in an action alleging that he had knowingly submitted false financial documentation to obtain a $2.9 million line of credit. The indictment further alleges that, beginning in or about December 2012, Boston and LaBarge caused Zloop to raise money through the sale of equity. To sell equity in the company, the indictment alleges that Boston and LaBarge caused a misleading private placement memo (“PPM”) to be sent to investors who ultimately invested approximately $2.5 million in Zloop. According to the indictment, the PPM contained material half-truths and omissions, including the omission of the litigation and bankruptcy history of Boston, and the fact that Boston and LaBarge had already caused Zloop to spend more than $1.5 million on their personal real estate. The release said the indictment further alleges that upon investors wanting their money back around the middle of 2013, Zloop got a $3 million loan and LaBarge allegedly sent the loaner a fraudulent financing statement that appeared to be filed with the North Carolina Secretary of State. The indictment further alleges that the loaner opened a credit line for the two upon receiving the statement, and that Robert Boston and LaBarge drew about $4.8 million from the line on two separate occasions to fund things like a plane, a new Chevrolet Corvette and a new Jeep Grand Cherokee. According to the court statement, the indictment also alleges that Robert Boston and LaBarge put more than $500,000 from the credit line into “racing-related expenditures” and $79,808 into a suite at a professional football stadium. KBM released Boston and later sued him and Zloop, alleging they missed $650,000 in payments after making $1.55 million in payments as part of their annual deal for Boston to drive the truck with Zloop as the sponsor. The lawsuit is still pending against Justin Boston, having been stalled by Zloop bankruptcy proceedings. The conspiracy charge and bank fraud charge each carry a maximum prison term of 30 years. The wire fraud charge and the securities fraud charge each carry a maximum prison term of 20 years. The maximum penalty for the money-laundering conspiracy charge is 10 years in prison, and the maximum prison term for false writing is five years in years in prison. The Zloop fraud allegations are just the most recent in a long, reoccurring chronicle of scam artists making their way into the racing community—from sports-car racers sentenced for stealing from churches and running payday lending schemes that charged illegal interest rates, to Formula One team owners being arrested on fraud and conspiracy charges. Racing is expensive, sure, but at least cheat yourself out of your own money if you’re going to do it.